Strandow, D., Findley, M., Nielson, D., & Powell, J. (2011). 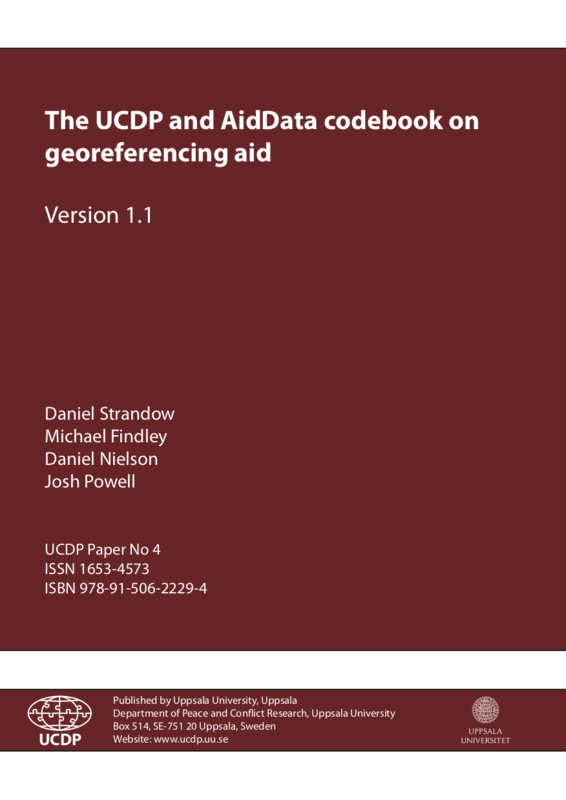 The UCDP and AidData Codebook on Georeferencing Aid, Version 1.1. Uppsala, Sweden: Uppsala University. This codebook details how aid events that are available from AidData and other donor sources can be assigned latitude and longitude coordinates, i.e. be geo-referenced, under the UCDP/AidData coding rules. The main objective is to record all locations to which aid dollars are committed or distributed. Locations that benefit indirectly are not coded, unless the geographic locations of the indirect areas are significant enough to be clearly spelled out in project documents.